In an era of generic, jump-scare laden horror films about ghosts and demons, anything other than the norm is destined for either one of two things: a receptive audience or critical success. Those two things are usually not mutually exclusive, and in the case of The Lodgers, what becomes of it remains to be seen. A film festival circuit darling almost by default, this Irish gothic horror film, helmed by Let Us Prey director Brian O’Malley, is a classy, and ultimately rewarding, experience for those wishing to get away from the mainstream and search for horror films that are allowed to be deliberately sluggish. The premise of The Lodgers follows two siblings, Rachel and Edward, in the early twentieth century. Orphaned as a result of their wealthy parents’ deaths when they were young, they become shut-ins in a dilapidated mansion, bound by a set of rules set forth upon them, which includes not being permitted to interact with others and to be in bed by midnight. Haunted and cursed by their past, the two find themselves at odds when Rachel longs to explore the outside world, particularly after she befriends a young man from a local village. Soon they are faced with the spirits that haunt them, including those within a mysterious flooded room beneath their foyer. 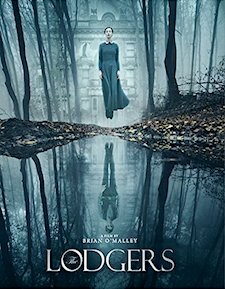 The most promising aspects of The Lodgers have nothing to do with its story, but rather how it’s told. It builds dread well within an extremely slow-burn pace, to the point of nothing much happening at times. The gloomy, dark interiors of the mansion itself make for a spooky environment, which are severely under-lit, forcing you to peer into the shadows a bit more than you normally would. My only real issue with the film is that there are very few characters that we actually spend enough time getting to know outside of Rachel. She has real depth and we understand her plight completely, but it’s the other characters, including her maudlin brother, her potential love interest, and a one-dimensional bully-type, that give me pause, longing for traits that are a little less surface-level. Regardless, The Lodgers is an exercise in presentation. The encroaching darkness that looms over Rachel and Edward is really what the film is about, more so than any of the character minutiae. Dread Central Presents offers a fine Blu-ray presentation that basks in the film’s dim cinematography. Indeed, if your TV or projector isn’t properly calibrated, you’re definitely going to notice. This isn’t a Barry Lyndon type of situation where candles are the primary lighting source. It’s more about the darkness itself, and what could possibly in it. As such, it’s a strong presentation of its digital source. Despite the well-composed frame, some depth is lost due to its flat nature, but everything is given an ample amount of detail. Colors are often muted, but some sequences which take place in forested areas do reveal some strong hues. Skin tones range from natural to pale, which is intentional, while black levels are thick and inky. Contrast and brightness levels are ideal as well, and there appears to be no encoding issues. For the audio, there’s a variety of options, including an English 5.1 DTS-HD track; English, Spanish, French, German, and Portuguese 5.1 Dolby Digital tracks; and an English 2.0 Dolby Digital. The main 5.1 presentation is immersive without being overly active. Atmosphere and ambience is the name of the game here, more so than speaker to speaker movement. It’s a somber presentation with clear dialogue reproduction, precise sound effects, and a well-placed score. Subtitle options include English SDH, Spanish, French, German, Portuguese, Danish, Finnish, Norwegian, Swedish, and Dutch. This release also carries a few extras, including the 22-minute featurette Behind the Scenes of The Lodger, much of which is EPK in style but offers a nice amount of information that a lack of an audio commentary makes up for. Also included are two deleted scenes: Bathroom Scene and Birmingham Shop, which are roughly two minutes in total; the film’s trailer; a TV spot; and trailers for Imitation Girl, Terrifier, Zombiology, and The Monster Project. All of this material is presented in HD. Also included in the package is a DVD copy. I would personally describe The Lodgers more as a thriller than horror, despite its supernatural dealings and dark interior settings. It’s less about ghosts that are coming to get someone and more about how these people deal with the lot that’s been handed to them, and us an audience hoping that they come through it unscathed. It’s also a much more sophisticated offering from Dread Central Presents, which hands over the film with an excellent presentation and a nice set of extras. It’s definitely worth your time.